Spend the day visiting Tombstone Arizona, the "Town Too Tough to Die" and perhaps the most legendary mining camp of Arizona. 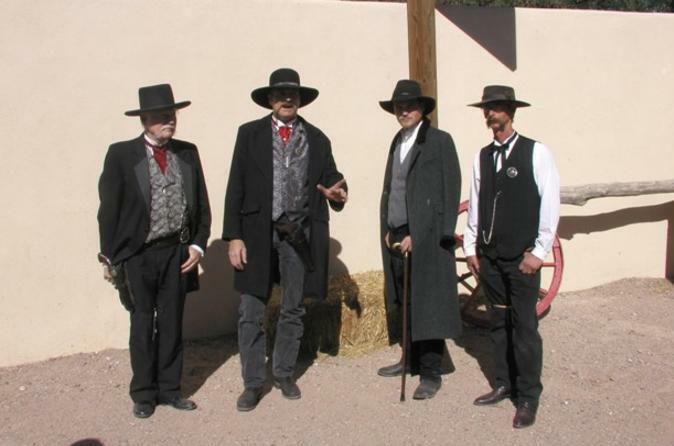 See America's best example of Western heritage, Tombstone's 1880s buildings and artifacts that are well preserved and featured in numerous museums. Walk the streets past Big Nose Kate’s Saloon, originally the Grand Hotel built in 1881 and later owned by the rumored girlfriend of Doc Holliday. Stop by the infamous OK Corral where the most famous 30-second gun fight ever happened. Pass the Birdcage Theatre, a combination of theater, saloon, gambling parlor and brothel. The legendary home of Doc Holliday and Wyatt Earp is yours to explore with a visit to the Tombstone Historical Courthouse and the Boot Hill Cemetery, where some of the west’s most colorful characters were laid to rest. On the way back to Phoenix, visit a truly unique stop, the White Dove of The Desert, one of the Southwest's best preserved missions at San Xavier del Bac, just outside Tucson. The historic Spanish Catholic mission is known as the "place where the water appears", as the Santa Cruz River (which runs underground) surfaces nearby. Relax in the luxury van on your trip back to Phoenix though the Sonoran Desert.